Evaporation rates are high in the hot, dry and windy climate. There is little fresh water run-off or seepage into Shark Bay because of low rainfall. Dirk Hartog, Bernier and Dorre Islands limit the flow of low salinity oceanic currents into the bay. Shallow banks created by seagrasses restrict tidal flow into and out of the southern parts of the bay, further preventing dilution of waters in the upper reaches. The most saline parts of the bay are Hamelin Pool, the southern part of L’haridon Bight and the southern extremes of Freycinet Harbour. These areas are hypersaline – almost twice as salty as the open ocean. The northern part of the eastern gulf and almost the entire western gulf are metahaline – up to 1.5 times as salty as the open ocean. Hypersaline and metahaline waters are unusual in ocean environments and Shark Bay is one of the few marine environments in the world with hypersaline waters. Exuma Cays in the Bahamas is another. 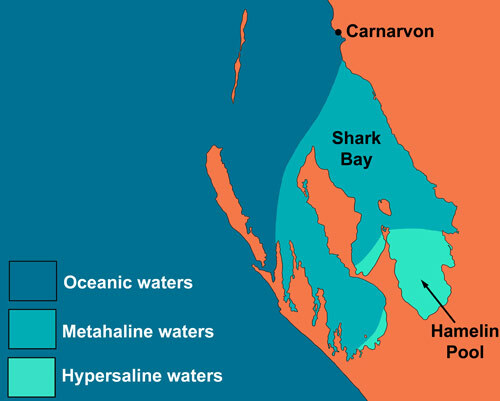 The geological processes creating hypersaline waters and unique ecosystems they support are among the features that lead to Shark Bay’s World Heritage listing. Following is an explanation of this presented on an interpretive panel.